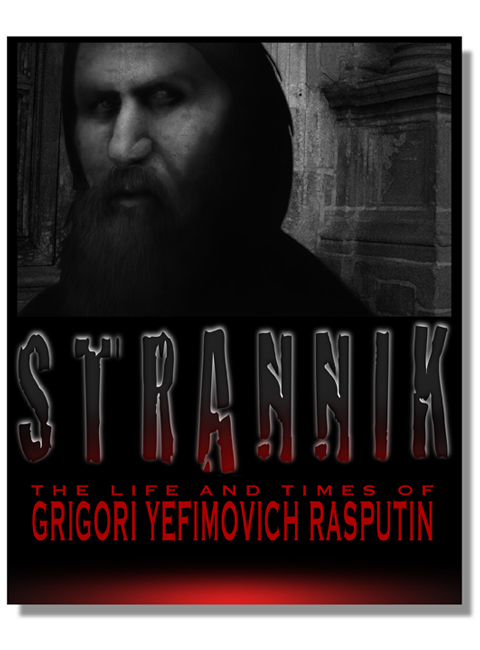 I've heard that Grigori was a real party animal. Yeah...I thought examining such an iconic figure would reveal many. surprises. I'd like to read up on him, too. ANOTHER nice cover. I like the font work on "Strannik" & the softened visage--he doesn't seem so sinister--& the black with red & white accents works well. My high skrool history teacher loved the guy: My college prof tried to make every major figure in history a perverted deviant of some sort (both were female). I didn't know what to think. I did a bit of scanning of what little I could find back then, & a little more before this post. Call me a skeptic, but I don't believe he was as colorful as he has been portrayed (certainly no saint, but not sinister, either); he was probably a scapegoat for an incompetent, tyrannical regime. It's hard for me to believe that every high aristocrat in a dynasty could be taken in by a debased peasant svengali. More likely he told them what they didn't want to hear, they disregarded what he said, & the rest is [revisionist] "history." Tyrannies are good that way. Solid commentary. I appreciate how you critique the artwork itself and then offer a view of the subject matter, including personal insights. Somewhat brief and thought-provoking. Nice. Iconic figures whose reputation is somewhat political will always be put through history's grater. Just realizing the where hype lies is what makes History so relevant. This page contains a single entry from the blog posted on September 28, 2012 12:26 AM. The previous post in this blog was Napoleon Dynamite. The next post in this blog is Random Caricature.